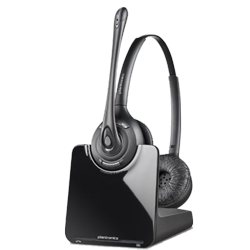 This is a quick introduction to the Plantronics CS520 wireless headset. There are two versions of the CS520 headset available. The standard CS520 will allow you to have up to 38 units in one area without sacrificing distance or causing any audio issues. There is also a CS520-XD, which is the exact same unit, but it’s on a different frequency, so you can put more units in one area without having any issues. The Plantronics CS520 dual-ear wireless headset has a headband over the head with speakers on both ears. It has an adjustable headband, so you can get a really good fit. The biggest benefit of the dual-ear headset is that you can hear your caller better. You won’t be distracted by any background noises, and you will be able to focus better. Compared to an over-the-ear or single-ear model, the CS520 will work very well in a quiet environment, an average office, or even a loud environment, because the ear cushions will block out background noise. The HW520 comes with a noise-canceling microphone. The microphone is bendable to help ensure you get good mic positioning. The best mic position is roughly a quarter of an inch away from your mouth. That way the noise-canceling microphone is really targeting your voice. That also helps to cut down on background noise around you, so your caller can really hear you over everything else. If you’re in a quiet environment, you can still use this unit. If you have a co-worker that needs to talk to you, simply put one side of the headset off behind your ear. You can talk to somebody around you, put the headset back on that ear, and away you go. So it’s really useful for any environment. The key being it helps you focus on calls and not be distracted. The base that comes with it is what plugs into your telephone. At night you put the headset in the base to charge it for the next day. On the bottom of the base, there’s a slide switch, so it makes it compatible with almost any phone you will use. There are controls for the microphone volume and for the speaker volume. You will find that choosing the CS520 wireless headset will be a big productivity booster. To clarify, when you use a corded headset, you have the ability to write and type hands free. But when you choose a wireless headset, you take it up a notch, because now you can continue talking to your caller while you walk to grab a file or ask a coworker a question. So those accessories really help get the work done, because you’re able to roam around your office while carrying on a conversation. One thing to consider when you buy a wireless headset is buying a compatible lifter or EHS cable at the same time. You’ll spend a little bit more adding the cable or headset lifter, but you will get a lot more out of it. When you add the lifter or EHS cable, you take it up another notch, because you can answer calls remotely just by pushing a button on the headset, so you don’t have to rush back to your desk to answer or hang up a call. You will also get beeps in your ear when you have incoming calls, so you never miss calls to voicemail or play phone tag. The Plantronics CS520 wireless headset is very light at 96 grams. You get 13 hours of talk time and an amazing 350 feet of range.